In our look at Hillary Clinton’s health plan yesterday, we pointed out that of seven big problems that Obamacare didn’t fix, she had ignored perhaps the biggest. Despite saying that she shared Bernie Sanders’ goal of universal coverage, she hadn’t actually proposed a plan to get there. At the end of the post we said that we hoped she’d put out something more ambitious. Continue to support a “public option”. These new proposals would in fact expand coverage to more people, moving us closer to universal coverage. But how close would they actually get us? the rest are eligible for coverage under the ACA, but will, for one reason or another, choose to remain uninsured. So let’s look at how effective Clinton’s proposals might be for getting people in each group covered. Encourage states to expand Medicaid. Clinton says she’d do this by following President Obama’s proposal to allow any state that signs up for the Medicaid expansion to receive a 100% match for the first three years. The Affordable Care Act said that between 2014 and 2017 the federal government would cover 100% of the costs of newly eligible enrollees, before phasing down to a permanent rate of 90% of costs starting in 2020. What that means is if a state decides to expand now, they’ll already have missed the three years where expansion is free. As we noted a while back, more and more red state governors are already considering expansion— giving them the same 100% match for three years that states who signed on earlier got could help nudge them along. Expand access to families regardless of immigration status. Opening the ACA exchanges to the eight million undocumented immigrants who are currently shut out is definitely a positive step; but unless they’re also able to qualify for Medicaid, CHIP, and subsidies, only a small percentage will actually be able to afford coverage. Unfortunately Clinton’s plan says nothing about these key details. Investing $500 million annually in an enrollment campaign. Surveys of the uninsured show that many still aren’t aware that large subsidies or free Medicaid coverage could be available to them on the exchanges. A campaign to increase awareness would definitely help in states that haven’t embraced the law– states that did more aggressive outreach, like Kentucky and California, saw bigger drops in uninsurance rates. On the other hand, these states also show the limits of outreach alone: uninsurance in Kentucky is still around 9% and in California it’s over 11%. Enhance the premium tax credits on the ACA’s exchanges. The details are vague, but she says (1) those now eligible for subsidies would pay less of a percentage of their income than under current law, and (2) no family buying coverage on the exchange would spend more than 8.5% of their income for premiums. Of all her proposals, this one could potentially have the biggest impact on reducing the number of uninsured. Cost is the most common reason cited by the uninsured for not getting coverage, and I can’t count the number of people I’ve talked to who chose to go uncovered either because their premiums were too high, even with subsidies. But it really all depends on what the new levels are, and, at least for now, she doesn’t say. It doesn’t matter how much the employee would have to pay to purchase family coverage. The family members are not eligible for exchange subsidies if the employee could get employer-sponsored coverage just for him or herself, for less than 9.56 percent of the household’s income. And so we have a situation where 2 to 4 million Americans (including nearly half a million children) can’t get affordable coverage: premiums for family coverage through an employer would cost over 10% of a worker’s income, but their family members don’t qualify for help on the exchanges. Simply applying the affordability test to the cost of family coverage through an employer would fix this, something Sen. Al Franken has been pushing for. Clinton’s website doesn’t say how she’d fix the family glitch, but we assume she’d take the same approach. A public option, possibly run by states. This is another one where it’s impossible to tell how significant it is without more details. Supporters of a public option assume that it will be better and cheaper than any private insurance plan, but it really depends on how it’s set up and what it pays providers. As Balloon Juice’s Richard Mayhew explains, in many places a public option would probably look pretty similar to other silver plans, especially if it had to negotiate contracts with providers just like any other insurer. The main advantage of a public option would that it introduces competition in places with few plans, helping keep premiums down somewhat. But in terms of getting more people covered, it’s hard to see it having a huge effect. At the end of the day, Hillary’s latest proposals would move us closer to universal coverage, and they’re mostly things we could imagine a Republican-controlled Congress passing (if they give up their current strategy of total obstruction). Still though, as with her other plans, even if every one of them gets passed, we still wouldn’t have universal coverage. Meanwhile getting and using coverage would still be difficult and confusing– just slightly less so. Obviously more affordable coverage for more people is a good thing, but we’re still waiting for her vision of what all these incremental changes could add up to. Thanks for answering my comment yesterday. Interesting that Hillary is looking at the public option. Would another way to incrementally move towards universal coverage be to gradually lower the age limit on medicare? Couldn’t that be done in a revenue neutral way by increasing the medicare premium for those who take it at the lower age? That would be a bit like social security paying less for people who take it early. Have you seen such proposals? @John: The only ways for lowering the Medicare eligibility age to be revenue neutral would be (1) if people who took it at a lower age paid the full cost through premiums, (2) if we increased taxes to pay for them, or (3) some combination of those. But yeah, lowering the Medicare eligibility age is an idea that’s been floating around for a while, although I haven’t heard any politicians pushing for it since the Obamacare debates. Thanks for another good post, Rob. a. We set a community rate for Medicare, say $700 a month for Parts A and B.
b. We make sure that tax credits are available to anyone, not just up to 400 per cent of poverty. So a single person age 60 making $50,000 would get a tax credit of $300 just for example. They could add $400 a month of their own money and get full Medicare. c. This is much better than what happens on the ACA exchanges today, where in many states a 60 year old must pay $600 a month for terrible coverage. I really like the Clinton proposals to improve the ACA. She talks about reducing deductibles and copays. The only way to do this is by improving the CSR (cost sharing reduction) program, that is now available only to low income persons. Next post: Trump’s healthcare rhetoric is different from other Republicans. His actual plan, not so much. 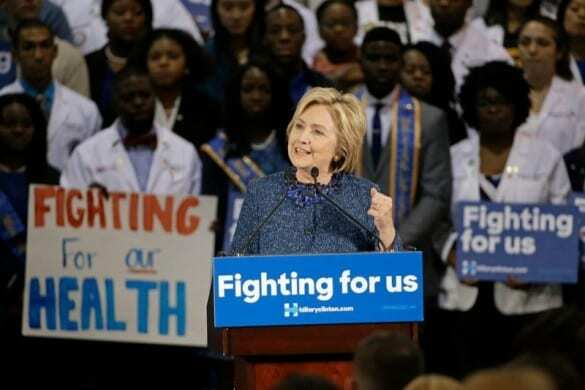 Previous post: Hillary Clinton wants universal coverage– but what’s her plan to get there?